Caleb Daniloff, writing in BU Today, interviews filmmaker Steven Spielberg who will receive an honorary degree from Boston University this weekend. This part of the exchange grabbed our interest—it’s about an interior smellscape we’d never known existed. 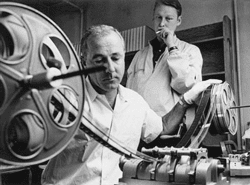 Many movies are now edited on computers, but you still put your hands on the film during the editing process. Does that tactile experience inform your work or is it just what you’re used to? I don’t think it informs my work. If it contributes anything to my work, it gives me some thinking time. When you’re working on the Avid and in the electronic medium, it’s an intuitive process because you’re working so quickly. And I use all my intuition when I’m directing. But when I’m editing, I like to spend time mulling things over. By the nature of the craft of splicing and taping soundtrack and picture, which takes a bit longer than clicking a mouse on a screen, it gives me time to be more thoughtful when I’m putting the picture together. I prefer how everything is really fast on the set during production, we’re all moving at light speed, and then all of a sudden it slows down. The postproduction process I just relish. Coming into work every day when I’m not running around the way I am on a film set gives me a chance to be more thoughtful. I also like the smell. When you walk into an editing room that has celluloid all over the place — in boxes, hanging from racks — the scent of the experience hangs in the air. Whereas when you walk into a room — and 99.9 percent of the people in the world cut on electronic editing bays — when you walk into those rooms, it just smells like a typical office. Can you describe that scent? It’s the scent of photo chemistry. The actual film gives off an odor. I do remember the smell of an editing room, the photo-processing chemicals, primarily. They say that MTV is to blame for the jumpiness of modern film, but I wonder if the way film is edited now also contributes to that. There is a place for the jump-cut, but is that place everywhere? I find its overuse to be annoying. It's part of the reason I've always loved developing my own photographs. When you walk into the darkroom the scent of photo chemicals gives you a frisson - it's where magic occurs. It's a similar feeling when you enter a perfumery lab. Wow, it's been a while since I printed my own photos but I can recall the smell of the chemicals. I also enjoyed the solitude of the darkroom, and the calm, deliberate experimentation with cropping, enlargments, and exposure times. You had to think about what effects you wanted and then try to achieve them. As Spielberg says, a thoughtful process, not the impulsive zip, click, print of Photoshop or MTV video.